We’d love your help. 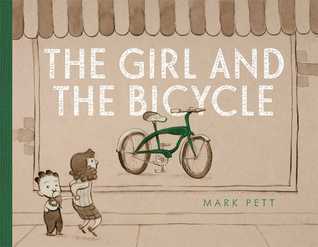 Let us know what’s wrong with this preview of The Girl and the Bicycle by Mark Pett. A little girl sees a shiny new bicycle in the shop window. She hurries home to see if she has enough money in her piggy bank, but when she comes up short, she knocks on the doors of her neighbors, hopi From the creator of The Boy and the Airplane, a touching wordless picture book about a little girl, a shiny bicycle, and the meaning of persistence—with an unexpected payoff. To ask other readers questions about The Girl and the Bicycle, please sign up. As she walks with her little brother, she happens to see a bicycle in a shop window. She scurries home to see how much money she's saved and soon realizes she'll have to find a way to raise the money. She meets a nice lady who could use some help, and once she's earned enough money to purchase the bicycle, she heads back to the shop. Follow along in the story to discover a new friendship and find out if her dreams for a new bicycle come true. This is a simply illustrated book with a powerful message of selflessness. This story is great for all and I highly recommend it. This is a picture book in the literal sense: it uses only pictures to tell its story, like the childhood favorite of many, The Snowman. The colorless illustrations (save the bicycle, which is green), are quietly beautiful, clean, and easy to follow. The story also--and most notably--has a pleasant old-time feel to it; the girl covets a simple bicycle; she counts money from a piggy bank; she sets up a lemonade stand and does chores for neighbors; she resembles a young Olive Oyl--all of this portr This is a picture book in the literal sense: it uses only pictures to tell its story, like the childhood favorite of many, The Snowman. The colorless illustrations (save the bicycle, which is green), are quietly beautiful, clean, and easy to follow. The story also--and most notably--has a pleasant old-time feel to it; the girl covets a simple bicycle; she counts money from a piggy bank; she sets up a lemonade stand and does chores for neighbors; she resembles a young Olive Oyl--all of this portrayed in a sepia color scheme. There are excellent morals here, and they’ve been told countless times before, so in that sense The Girl and The Bicycle is unoriginal; however, what is in, in spades, is moving, and it most certainly is memorable for so many reasons, not least of which is because it packs such a punch without a single word. I’m not a huge reader of wordless stories for kids. My reads usually need words to whisper, giggle, and tickle the audience. I’ve only come across a few over the years that captured my imagination and love. 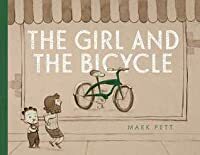 The Girl and the Bicycle by Mark Pett can be added to that short list. This book hit me right in the heart! Mr. Pett pulled me in with quiet, simple, plain illustrations of a girl and her plan to earn enough money to buy a bike. A bicycle she has been eyeing in the store window all year. Determination and patience and goodness shine on every page. This story has HUGE heart! We loved this book. Loved it, loved it. I checked it out of the library quite a few weeks ago, and it is long overdue. I've only read it to the girls twice though. I asked Poppy (3) if she wanted to write her first review about the book with me, and she said, "YES!!!" Right after that, Liz told me she loved the book, and has read it with the kids a whole bunch of times - and that it's Gwennie's favorite book that we have from the library right now. I almost invited her along for the review, but s We loved this book. Loved it, loved it. I checked it out of the library quite a few weeks ago, and it is long overdue. I've only read it to the girls twice though. I asked Poppy (3) if she wanted to write her first review about the book with me, and she said, "YES!!!" Right after that, Liz told me she loved the book, and has read it with the kids a whole bunch of times - and that it's Gwennie's favorite book that we have from the library right now. I almost invited her along for the review, but she's down practicing piano. Poppy: That's a lot. A lot a lotta writing, Daddy. Dad: Hey, hold on, Poppy. Are you ready to start? Dad: Did you like the book? Did you like the bicycle book? Dad: What is this book? Dad: What's the book about? Dad: Almost. How many stars do you think we should give it? Poppy: We should give it a lot. A lot. Dad: We should give it a lot? Dad: We can give it one, two, three, four, or five. Poppy: (Whispers loudly): I WANT FIVE! Dad: Do you want to say anything else? Of the children's picture books nominated for the Goodreads awards this year, this is my favorite so far. It's a wordless book simply illustrated, with heart. The drawing is obviously hand drawn and doesn't have the wit and sophistication of some of the others, but this one has the most heart. It has some Chaplin and Gift of the Magi sweetness in it, for sure, and similar moves. A girl wants a bicycle. How will she get it? Sweet, even a little moving. I liked it very much. This one's a keeper, the kind of picture book you want on your family bookshelf for years to come. A beautiful, pictures-only story of hard work and kindness has been turned into a timeless classic by the naive, old-fashioned illustrations that speak straight to the heart. So many special things jump out: a little girl's affection for her younger brother shown even in the way she holds his hand; the subtle humour in the images with little brother popping up in random places; the girl's ingenuity a This one's a keeper, the kind of picture book you want on your family bookshelf for years to come. So many special things jump out: a little girl's affection for her younger brother shown even in the way she holds his hand; the subtle humour in the images with little brother popping up in random places; the girl's ingenuity and hard work in earning money; the little boy's oblivion to the purpose of their quest but his sister's care that he be included; the little girl soldiering on in spite of disappointment and managing to think of others; and on top of everything the fact that the object of the girl's aspirations is a good old-fashioned bike and not some other useless gizmo. And for sentimental types like me, it definitely passed the tearjerker test. A beautiful story told without words. Adults and children will love discussing what is transpiring on each page. The illustrations are so expressive and even adorable. A little girl is walking past a toy store with her little brother when she sees a beautiful green bicycle. She must have it, but she doesn't have enough money to buy it. What can she do? She decides to work for it. After several tries she finally meets a lady who hires her to help around her house. The illustrations show how she help A beautiful story told without words. Adults and children will love discussing what is transpiring on each page. She decides to work for it. After several tries she finally meets a lady who hires her to help around her house. The illustrations show how she helps through the year and if she gets enough money for her bicycle. Excellent in so many ways, but if you have read, "The boy and the airplane" and pay attention to one particular illustration (hint: it's the only one with red instead of green), you will probably cry. SUCH A GREAT STORY. I had goosebumps by the end, not entirely sure if that's because of the temp in the room or if the story was just that heart-warming. Can a book get more than 5 stars? What a wonderful heart-felt story. Also loved the tiny shout out to Pett's other book: The Boy and the Airplane. My new favorite wordless picture book! It made me tear up at the end. I loved every page..but the last 2 pages are the best. you guys. THE FEELS. TEARS. love. Her eyes are on the prize: the shiny green bicycle in the storefront window. Determined to have the bike has her own, the little girl sets out to earn enough money to buy the coveted bike. She searches the couch cushions, opens a lemonade stand, and rakes the leaves from the yard. One friendly neighbor admires the girl’s hard work and provides odd jobs to help her earn the money. As the Fall leaves turn to snow, the girl finally earns enough money to buy the bicycle! She proudly bounds back to t Her eyes are on the prize: the shiny green bicycle in the storefront window. Determined to have the bike has her own, the little girl sets out to earn enough money to buy the coveted bike. She searches the couch cushions, opens a lemonade stand, and rakes the leaves from the yard. One friendly neighbor admires the girl’s hard work and provides odd jobs to help her earn the money. As the Fall leaves turn to snow, the girl finally earns enough money to buy the bicycle! She proudly bounds back to the store, but what she discovers when she gets there is shocking. Read The Girl and the Bicycle to find out the girl’s discovery, and if her dreams of owning the beautiful bicycle will come true. The wonderful thing about this story is that it can be interpreted in many ways because it is a wordless picture book. I use this story to teach my second-grade class how to use a storyteller’s voice in narrative writing. It is so interesting to see how they tell the story differently each year. Pictures can tell such a detailed story if we just look closely. The girl and the Bicycle is a word-less book that can be used for children to tell their own story. By looking at the pictures students will give their account of what is taking place. Students will be able to see the story shape through their words, which can be used as a motivational tool for beginning readers. This reading activity will be recorded on chart paper, and posted in the classroom. Super. Sweet. I love wordless books, and I loved that she worked so hard for her dream and when she couldn’t realize it she bought something for her little brother who was her constant companion. Her thoughtfulness and kind heart was rewarded. Love lit at its finest. Oh my goodness. I'm trying to keep the tears in. They don't usually jump to my eyes THAT fast. Such a simple book and yet so sweet. Simple illustrations, but I love them. No words, but so much can be conveyed in those simple illustrations--which is amazing. And that the girls makes a lot of effort to achieve what she wants. Then what she chooses to do at the end--that was sweet right there. But what happened at the very end, oh my word. Still getting tears thinking about it. This feels like a Pr Oh my goodness. I'm trying to keep the tears in. They don't usually jump to my eyes THAT fast. Such a simple book and yet so sweet. Simple illustrations, but I love them. No words, but so much can be conveyed in those simple illustrations--which is amazing. And that the girls makes a lot of effort to achieve what she wants. Then what she chooses to do at the end--that was sweet right there. But what happened at the very end, oh my word. Still getting tears thinking about it. This feels like a President Monson story in JP form. So, so good. Though they may not be able to tell me everything happening in the pictures, I really want to try this in storytime. We'll see if I can keep from crying! 1/14/15 My first wordless book with this crowd. Granted, it was a more involved one even with its simplicity. They're not as used to calling out what's happening, yet. But I helped them along. I prodded them in what was occurring and who was doing what. It definitely engaged them with the book. They were sorry to see the bike sold, but liked what she did instead. So the kids were happy to see what the older lady did, and the adults seemed to like it as I did. So sweet! with a fun conclusion to the story. The girl has her younger brother with her when she sees a new green two-wheeled bicycle in the store window. She needs money in order to buy this bike so she empties her piggy bank, checks her pockets, the dryer, under the couch pillows, only to find that she hasn't enough. She contemplates her options as seriously as a young girl can. She decides to find work raking leaves. After several disappointing attempts, she is hired. She works, not only raking leaves but any other chore the woman can find for her to do around her home. Finally, the girl has enough money to buy the bicycle. With money in hand, she heads to the store only to find it gone. Surprisingly, she decides to buy her brother a tricycle instead. Without giving the ending away, there is more to the story...and that is all I am willing to say! The illustrations are simple and so perfectly clear, filled with expression and emotion in a quiet sort of way. Mark Pett has given us a sweet story filled with thoughtfulness, persistence, and love. Mark Pett is the “authorstrator” of The Boy and the Airplane and The Girl Who Never Made Mistakes. He is creator of the syndicated comic strips Mr. Lowe and Lucky Cow. He lives in Salt Lake City. You can find more about him and his books @ MarkPett.com. This is another great "wordless picture" book by Mark Pett. He can convey such great stories without saying a single word. This was a story of a girl who really wanted to get a green bicycle. She was very industrious of her pursuit of said object. The book takes you through the hard work that she did to go after the bike. All along her little brother is with her. The story has a very sweet surprising ending and it is very touching. This is book about hard work, determination, and sacrifice. I lov This is another great "wordless picture" book by Mark Pett. He can convey such great stories without saying a single word. This was a story of a girl who really wanted to get a green bicycle. She was very industrious of her pursuit of said object. The book takes you through the hard work that she did to go after the bike. All along her little brother is with her. The story has a very sweet surprising ending and it is very touching. I don't always go for wordless picture books, but this one is very, very charming. A girl, with her baby brother in tow, is walking past a shop when she sees a shiny green bicycle. Well, she's completely entranced by it, and devises all sorts of schemes to get the money to purchase it. The story takes a couple of twists, but there is a happy ending, and this is really a very powerful testament to hard work and generosity. I think kids and parents alike are going to love this one. THE GIRL AND THE BICYCLE Mark Pett has done it again. The artwork and story of this wordless picture book is soft, heartwarming and captivating. I've always loved the "old world" feel of his illustrations, and the stories he tells have that wholesome, old-fashioned quality and sense that I am drawn to, with that yearning for a simpler time. I love wordless picture books because the words don't get in the way of a good story. Not only that, but each time you "read" it, you get a slightly different story. This picture book for young readers is pretty straight forward in terms of the story line and has lovely illustrations. Lovely book without words. Shows a girl who wants a bicycle and doesn't have enough money to buy it. She then figures out ways to make money to get it. Great ending. Perfect timing for us to look at this book...Jacob is trying to earn money to buy a Star Wars Millennium Falcon lego set. Very nicely done--beautiful pictures and an even more beautiful message. This is probably one of the cutest children's books that I have "read" in a long time. It goes to show you that you don't need words to tell an amazing story. Why aren't there more books about sacrifice and blessings like this one? Made me tear up at the end! Wordless storytelling at its best. Dare you not to sniffle. The sweetest, most heartwarming book with no words I have ever encountered.